The Grease grooves cut on the rail-guides keep it lubricated Reinforced piston provide extra duration during rapid & prolonged firing. 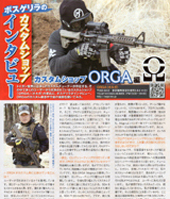 We carry predominantly ORGA brand products and All Japanese made airsoft products on our ORGA International Webshop. 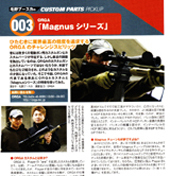 We are currently placing emphasis on such brands like Tokyo Marui, PDI, Laylax and Systema, FireFly etc. If there is a specific brand our product that you would like to see us carry in the future, please feel to contact us at any time. In regards to payment method we are currently accepting payment through PayPal only. Once we confirm your order we will send the e-mail address listed in your PayPal account a confirmation e-mail with your order details.